April 2018 – The Consortium GOPA-Passivhaus Institut visited the first projects under construction. These form part of the pilot stage of the construction, where the local expert assigned to the team supervises the process. S/he is also in close contact with the Consortium GOPA-Passivhaus Institut to guarantee that any challenge or problem during construction is identified, solved and can be prevented in the next stage, where the rest of the houses will be built. During the visit, while some areas of improvement were detected, the results from the Blower Door Test were very good, with one of the projects even achieving a value below the 0,6/h at 50Pa required for Passive Houses. Learn more about the visits in Elena Reyes' article "On the road to Passive House buildings in Mexico" and read about the impressions from Micheel Wassouf here. January 2018 – The project developers, local experts and the team of the Consortium GOPA-PHI, together with SHF are working hard to make the Passive Houses a reality in Mexico. By the beginning of 2018, 2 projects are already under construction, 2 more have finished the planning phase and 4 more are defining the final details to get there! June 2017 – After a review of possible projects to be optimized, 2 more companies were chosen to take part in the LAIF Component of the Ecocasa Program. The projects, which include an apartment building in Mexico city, will be located in the central part of the country. 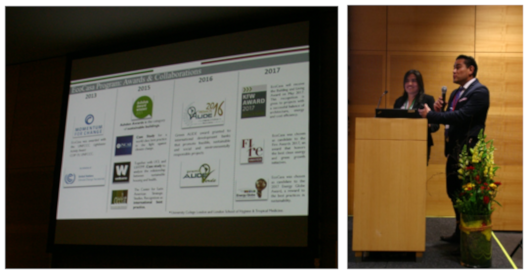 April 2017 – The LAIF Component was presented in the 21st International Passive House Conference in Vienna, Austria. The project was presented by Elena Reyes, Passive House Institute, from the Consortium GOPA-Passivhaus Institut and Ernesto Infante Barbosa, Sub-Director of Multilateral Affairs and Sustainability in SHF. September 2016 - The Passive House Institute together with the partners of the Ecocasa LAIF Program organized a workshop to present the technologies that help achieve the Passive House Standard. The workshop was all about bringing together companies interested in building houses that are more energy efficient and manufacturers that make this possible with readily available technologies in Mexico. The one-day event included 14 manufacturers of different technologies and more than a 100 attendees, who had the opportunity to network with one another and share experiences and ideas! 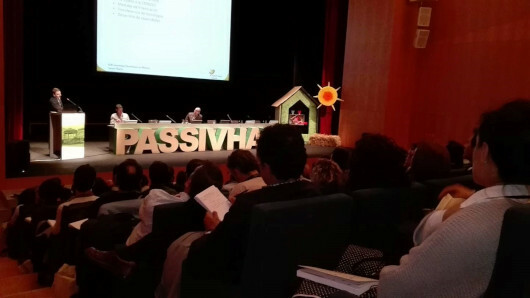 May 2016 – Javier Flórez from the Consortium GOPA-Passivhaus Institut presented the status of the LAIF Component in the 8th Spanish Passive House Conference (8CEPH) in Pamplona, as part of the session “Passive House City”. CEPH is one of the main events in the field of energy efficiency in buildings in the region. May 2016 – The representatives from the 5 companies selected to build the Passive Houses are getting ready to start with the planning. Together with the team of local experts that will be guiding the optimization of the project, the developers attended a 5-day course in Mexico City. The course included all the concepts of the standard Ecocasa MAX/Casa Pasiva and PHPP. Javier Flórez from the Consortium GOPA-Passivhaus Institut led the course together with Micheel Wassouf, director of Energiehaus Arquitectos. May 2016 - After the call for proposals launched last year by Sociedad Hipotecaria Federal, 5 out of 14 housing developers in Mexico were selected to participate in the LAIF Component. The selected developers will take one of their existing prototypes and together with a local consultant, will optimize it to the Ecocasa MAX / Passive House standard. The optimized prototype should also achieve an 80% reduction in the GHG emissions during the lifecycle of the house, and be cost-efficient. 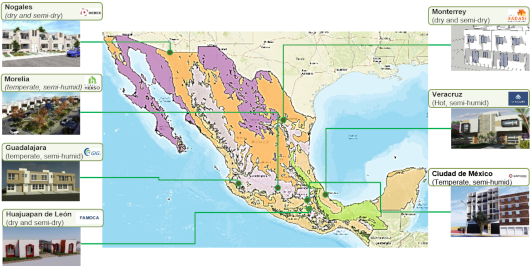 The projects are located in different cities and climate zones in Mexico. See map below. a)Economic incentives in the form of bridge credits and a subvention to cover up to 70% of the additional costs related to the energy efficiency measures, managed by SHF. b)Technical support provided by the consortium GOPA | Passivhaus Institut, who works together with local advisors to guarantee that all projects achieve the Passive House standard and are built according to planning.